After a few weeks hiatus (sorry, folks! ), Breaking Up With Betty Crocker is back! And, I have a whole slew of recipes lined up to share with you! As much as I love baking “just because”, I love baking for special events even more. There is just something about baking for birthdays, holidays and other special events that feels even more blissful than usual. As I often say, I love making people happy, and I love baking things. It just so happens that the two often go hand in hand. This seems especially true when a celebration is involved. I’ll note that there are tons of champagne cupcake recipes out there. Some have whipped toppings, some have fillings, some are made with chocolate (Hmm, chocolate AND champagne? This post may need updating soon…), and some use boxed mixes rather than a cake from scratch. Given that this blog chronicles my “breakup” with the lady on the cake mix box, it likely will not surprise you that I took a pass on the boxed recipes and sought out a cake from scratch. After quite a lot of searching, I stumbled upon this recipe for Sparkling Champagne Cupcakes from YumSugar. It was simple, but elegant and it used a lot of ingredients I already had on hand, so I knew it would be a winner. The recipe on YumSugar has a pastry cream filling, which also adds to the champagne flavor. I had a few time constraints when I was baking these cupcakes (Mostly due to a need for sleep. Fact: I frequently bake things between the hours of midnight and 2am. Thank heaven for the 24-hour grocery store down the street), so I passed on the pastry cream filling and just did a champagne cupcake with a champagne icing. I found that there was just enough champagne flavor in the cupcake and the icing in the end that it was perfectly balanced without being too overpowering. The cake batter for this recipe came together a bit differently than my usual cakes. Because the cake is made with sour cream, the batter is a bit heavier, and it may take a bit more mixing to get it smooth. Don’t panic, after enough beating, all will be well. The icing requires a champagne reduction on the stove. Reducing the champagne gives the icing a nice, potent champagne flavor without watering down the icing, so you definitely do not want to miss this step! I myself was intimidated by this process, but really once you start heating the champagne, it’s really quite simple, just watch it carefully so that you don’t boil it all away. The icing was too soft for a shaped icing tip (a star or the like), so I just used a large round tip and iced a nice spiral on the top and sprinkled it with pastel dragées, which give it a nice “bubbly” look. I also added a tiny bit of gel food coloring to give my icing a pinkish hue. Without the coloring it comes out as a nice white. There you have it, champagne cupcakes! Now, pour yourself a nice glass of your leftover champagne, sit back and enjoy! In the bowl of a stand mixer fitted with the paddle attachment, cream together butter and sugar until light and fluffy. Add eggs one at a time beating well after each addition. Add vanilla and mix. Whisk together flour, baking soda, baking powder and salt, set aside. In a medium sized bowl, whisk together 1/2 cup champagne and 1/2 cup sour cream (mixture will fizz and bubble a little). Add flour and Champagne mixture alternately, beginning and ending with flour. Batter will be thick. Fill cupcake papers with 1/4 cup level measures of batter (I use a cookie scoop like this one. The springloaded scraper helps make filling cupcake wrappers so much easier and more accurate). Bake for 17-22 minutes. Set aside. Make the frosting: Place 1 cup of champagne in a small saucepan. Simmer over medium-high heat until reduced to 2 tablespoons. Transfer to a small bowl or condiment cup and allow to cool. In the bowl of a stand mixer fitted with the whisk attachment, cream softened butter and powdered sugar together. Once the frosting is thick and fluffy, pour in the reduced 2 tablespoon Champagne plus 1 tablespoon Champagne from the bottle and mix well. Frost the cream-filled cupcakes and decorate with pastel dragées. 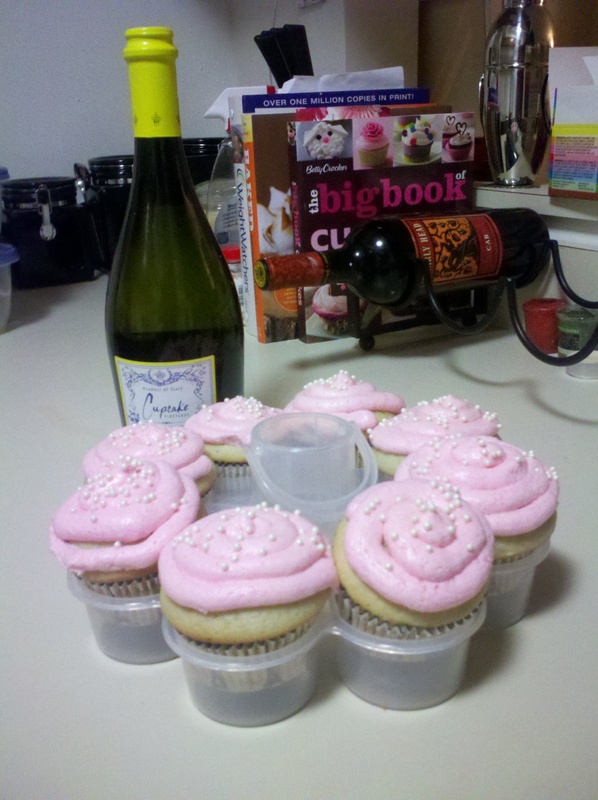 This entry was posted in Cupcakes, Uncategorized, Wine by Ashley. Bookmark the permalink.